2018 has been an incredible year for everyone here at CFPAC. From supporting policy efforts to create economic opportunities for urban farmers and worker cooperatives to welcoming two full-time staff members – Brenda and Kara–, we can’t possibly recount every single event, opportunity, meeting, and victory we had this year! Instead, we’ve rounded up the top four things we’re grateful for. In March, the Cook County Board of Commissioners adopted the Good Food Purchasing Program. Championed by its Commission on Social Innovation, the policy placed racial equity at the center of the County’s groundbreaking program. By adopting this resolution, Cook County became the largest municipality in the nation to take a forward-thinking approach to the systems delivering healthy, local, fair, humane, and sustainable foods. The Cook County Board of Commissioners was also awarded the 2018 Good Food Policy Hero by the Center for Good Food Purchasing! We know that the next summit is technically next year, but we are too excited not to talk about it! On February 28 2018, food justice advocates, urban farmers, and small food businesses across Chicago and the Midwest gathered at the 13th Annual Chicago Food Policy Summit to reflect on and strategize around Chicago’s food policy issues. With over 300 attendees and 25 speakers, discussion varied from how to support new farmers to organizing worker cooperatives. We are thrilled to continue the conversation at the 14th Annual Chicago Food Policy Summit on February 15, 2019 at the South Shore Cultural Center. Urban Stewards Action Network (USAN), a project of Chicago Food Policy Council, has been in the works for a number of years to cultivate connections and provide peer-based mutual support among Black and Brown communities. This year, USAN held the first two Food Fun(d)ing Fridays, a micro-grant contest and community fundraising event. 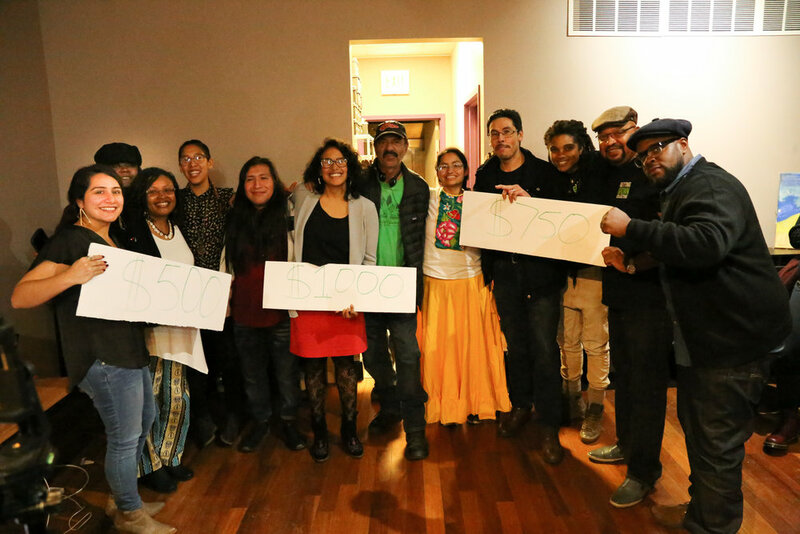 On October 26, USAN’s second event at B’Gabs Vegan Scratch Kitchen in Hyde Park welcomed over 60 participants and awarded $3,000 in grants to Catatumbo Cooperative Farm, Getting Grown Collective, Little Village Environmental Justice Organization, and Your Bountiful Harvest Family Farm. We’re looking forward to the next one on Friday January 25, 2019! In October, the emerging Good Food Buffalo Coalition from New York visited Chicago in the hopes of learning from Chicago and Cook County’s Good Food Purchasing victories and other efforts. CFPAC coordinated several meetings and excursions, including conversations with various stakeholders and partners. We were excited to show them the landscape of food in Chicago, share the wealth of on-the-ground work that GFPP folds into, and pass on stories and lessons learned from our experiences. We were particularly excited to show Little Village Environmental Justice Organization’s Semillas de Justicias (Seeds of Justice) Garden, which created a great moment to reflect on bringing racial equity to Good Food Purchasing. We are thankful for the wonderful exchange with the Good Food Buffalo Coalition, and we look forward to growing together. We’re excited for 2019 and we hope you’ll join us. We are raising funds to sustain our work to ensure the fair implementation of the Good Food Purchasing Policy and to direct resources improving the health and well-being of communities in Chicago and Cook County. Support us on Giving Tuesday!